Nine horses are part of the Sunktanka family. As a herd, these horses are donated for in-kind use by supportive owners and volunteers, or they have been donated to the program. 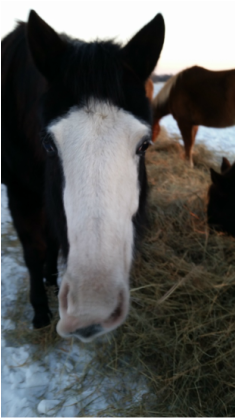 Each one of our horses have distinct personalities and talents. Some are used for young, novice riders, others are used for more experienced riders. They may be used for trail rides, commemorative rides, or horse competitions in either games or pleasure categories. All of our horses have demonstrated the temperament necessary for effective youth work, and many of our horses are older which make them steady, dependable teaching companions for the new riders. 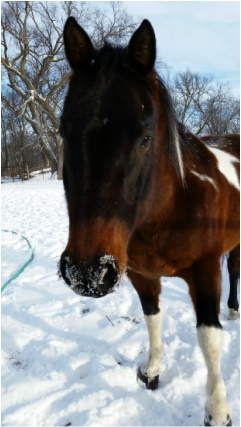 While the horses are used primarily during the months of March through December, they require year round care. These horses are the teachers for our program and they are the ones that will give their all to the people. We thank them and want to share with you who they are as well as the work they do. Please find the name of the horse as well as a little bio about them. 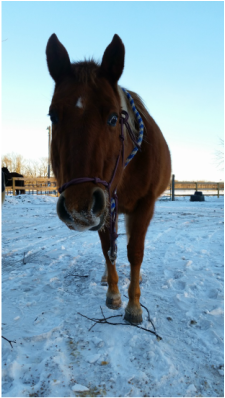 Pumpkin is a cute, Dunn mare quarter pony. At 20ish years old, Pumpkin still has a lot of pep in her step. She is a favorite in games and has won several competitions. This year she just made it to state with one of the Wikoska (young women). She is a little lady with big personality, Pumpkin can be used by riders of all skill levels. She is a great starter horse and knows her way around an arena. 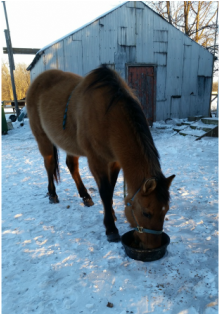 Mick is a handsome 20 year old quarter horse gelding. Sorrel in color, he is a beautiful Western pleasure horse. A bit tender footed, but great on the trail. Mick can be used by riders of all skill levels. He used to be a rodeo champion, but now likes to relax and take it slow. Every month he gets a shot to help his back From the picture, you can see he is quite the character. 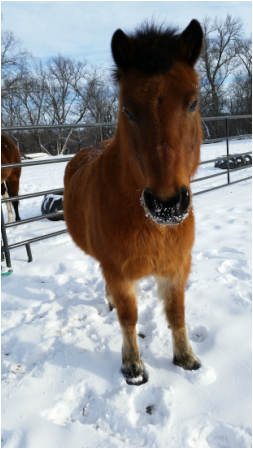 Honeybun is a pretty, little Welsh Pony. She is 10 years old. She was donated to the program by the same therapist that donated Wacouta. She had also been used in equine assisted therapy. It took some time, but she has settled in, and is used on trail. She also likes games! She has proven to have the endurance of any horse twice her size. Wacouta and Honeybun still pair up in the herd as they are best friends. She also made friends with the new horse Skada. She is our herd's own "My Little Pony", and she knows it. Wacouta, meaning Shooter in the Dakota language, is named for a Chief. He is the biggest horse in the herd, but is one of the gentle giants. 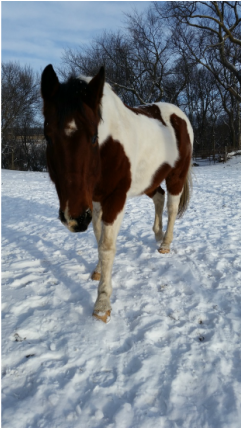 Wacouta is a 19 year old Paint gelding and provides a steady trail ride for all riders. Wacouta was donated to the program a few years ago by a therapist. He had been used in equine assisted therapy and prior to that, had been a commercial trail ride horse. training. She is a great trail and pleasure horse. Midnight has had some surgery on her back tendons in the past, so is no longer used in games professionally. This past summer, she was hurt with an infection in her back leg joint. We held a couple fundraiser to raise the money to help her and she luckily recovered. This winter she went on the 38+2 ride. Minnie is a fun, gentle, steady ride and can be used by riders of all skill levels. It is safe to say that she is our herd's biggest sweetheart with her gentle demeanor. Skuya, meaning sweet in the Dakota language is a beautiful Tobiano Paint. She is a younger member of the herd, and at 12 years old is used only by the experienced riders in games and on trail. She is full of personality and never fails to entertain when it is time to saddle up. She loves to be rubbed and will often remind you by laying her head on another rider's lap when standing still. She also is the first one at the gate when it's graining time and the first one to be done eating! Leo who is an arabian, has been in our herd for 2 years now. He is younger as well and is about 10 years old. Our experienced riders ride on the trail. He is very sweet and sometimes can get a little excited. He is right by Skuya's side all the time and likes to be first in line to be grained as well. We love him in our group and he has fit in very well! Wicanhpi Ska or Skada for short is an 8-10 year old Arabian, Appaloosa, and something else mix. He is so compassionate and sweet. We just got him this year and he has been fitting in. At first the horses took some time to get use to him, but he made good friends with Honey Bun. We have never seen him buck or rear, but instead when a rider fell off of him, he shook with fear. He follows us around and loves hugs and kisses. Skada has a brave heart, but still gets nervous about things like rocks from time to time. He is wearing a blanket in this picture since he gets cold in the winter.